FiftyShades HW, bay Westphalian gelding by BundesChampionship winner Fidertanz / Ehrentusch, born in 2009, standing approximately 163 cm or 16 hands. His pedigree is super impressive, his sire Fidertanz was the absolute shining star at the 14th NRW main approval in 2004. He left the scene with standing ovations as the undisputed Champion Stallion. Three exceptional basic paces, caution and ability at the fence, an easy going temperament and an exterior that leaves nothing to be desired left no doubt that he was the justified winner. His sire, Fidermark, won his performance test and has won the Bundeschampionat, Optimum and Grand Prix. Grandsire, Ravallo, also won his performance test with an index of 155 (dressage 157.52 - 1st place, jumping 127.5 - 5th place). Frühlingstraum II is deemed one of the pillars of Westphalian breeding and through Romadour II, Fidermark is inbred three times to founding stallion, Ramzes x. Findertanz's dam, granddam and great granddam were State Premium mares and competed in final rings. This dam line has produced numerous licensed sons and many of their offspring are successful up to advanced level in sport. 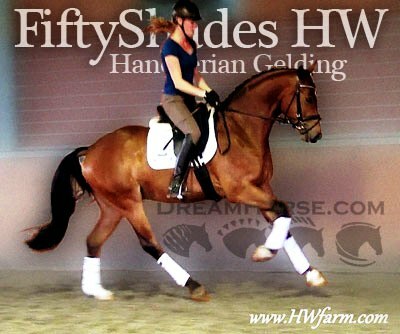 FiftyShades HW's dam is by Ehrentusch, who won his stallion performance test with top results in all categories, proving the marvelous versatility of this line. He also became reserve DLG champion, placing second to Weltmeyer. Ehrentusch's sire, Ehrensold, was a Rhineland state stallion who sired many top quality sport horses, including Entertainer, sold at the PSI and ridden by Dr. Reiner Klimke and Michael Klimke. Ehrentuch's showjumpers include Elastique 2. His dam, SPS Rheinfee, was Best in Class in Rhineland, 1983 and reserve DLG champion. She is also the dam of Ehrengold, who was presented successfully by Klaus Balkenhol. Rheinfee's sire, Rheingold, was winner of his keuring in 1977. Ehrentusch has sired many horses that have participated in the Bundeschampionat and has many top auction horses, including Ecciavelle, 200,000 DM. FiftyShades HW is a horse of unbelievable quality and super fancy mover who knows to impress due to his type, movement and work ethic. He is as pretty as a horse can get. Unbelievable beautiful in- and exterior, he has a super nice, chiseled head with a "stallion look alike" neck (he is a gelding!). He has the elasticity everybody is looking for. He has a free shoulder, a huge grundschwung and swings nicely through his back. This extremely talented gentleman has international potential. His walk is clean and rhythmic, his trot is impressive with a free shoulder and an active, far under himself reaching hind leg, his canter is uphill and breathtakingly beautiful. He is build for piaffe and passage! FiftyShades HW is a very sweet boy and has the talent to do it all. He is very rideable and trustworthy. The girl in the video loves to ride him and can't wait to get on his back as often as possible. He is easy to handle and loves his personal grooming time and puts his head right in your lap, striving for attention. He goes in the hot walker and takes a shower afterwards, then off to the solarium to relax and enjoys to get pampered. He stands for the farrier and travels well. He's easy and uncomplicated in hand as well as under saddle. Nothing really faces him, kids playing, other horses in the field next to him, big machines and more - he's a gentleman inside and out. This young star will go far in the dressage ring, he is your ticket to the top! Buy him now and show him yourself in the 4 year old Young Horse Championships in 2013 or take him to the Bundes Championships. check out his video clip!!! We take pride in answering every e-mail right away (at least at the same day) and to return each call. If you don't get a reply - please try again, our spam filter might have gotten in the way? !